Wes Lang, co-author of Hiking and Trekking in the Japan Alps and Mount Fuji, is in a race to reach the summit of Kita-dake before the encroaching fog. One of the most challenging parts of authoring a Cicerone guidebook is capturing clear-weather photographs, and there is no greater a place to test the patience than in Japan’s Minami (Southern) Alps, a mountain range that has earned the moniker ‘the Rainy Alps’. It is late July, and with the summer rain front starting to break up, I sit in a holding pattern waiting for a clear-weather climbing window before the onset of the typhoon season. 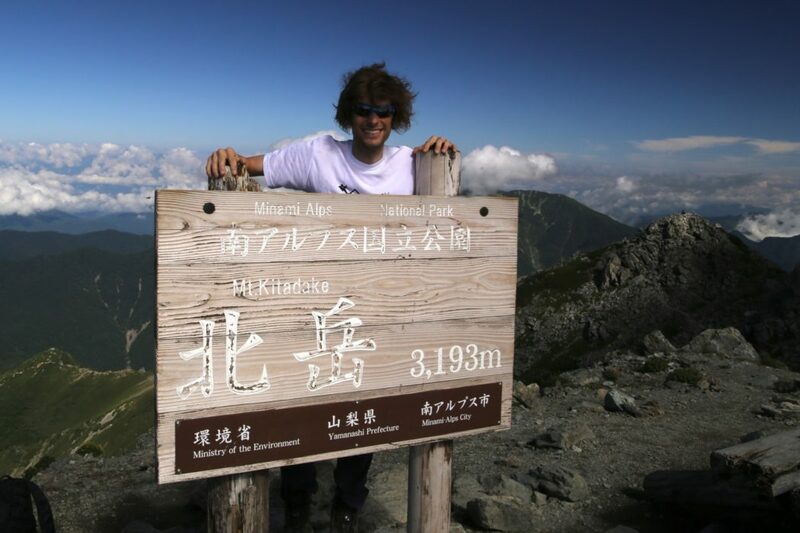 I study the weather maps and spot a small gap between two low-pressure systems: it is my chance to climb Kita-dake (3192m), Japan’s second-highest peak. I exit the bus under a blanket of thick mist and cross a sturdy suspension bridge spanning the Noro river. These waters flow south, transporting snowmelt from the Southern Alps and carrying it 130km south to the Pacific Ocean. On warm summer days you can spot anglers wading in the knee-deep waters casting bait for spotted char, a local delicacy. Just across the bridge you’ll find Hirogawara Sansō, a quaint hut and campground serving a hearty curry lunch and refreshing gelato, things best appreciated after the climb and not at the start of the long, steep hike. The path starts just to the left of the hut and soon enters a fragrant forest of fir, elm, hemlock and beech trees, dotted with moss-covered rocks and wildflowers penetrating the dense undergrowth. 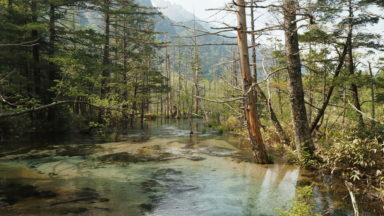 It is a pleasant stroll with minimal elevation gain for the first half hour, until you reach a well-posted junction: the left fork follows the river upstream towards the alpine, while the track to the right climbs a steep spur towards Shirane-Oike base camp, my home for the evening. Wooden ladders and fixed ropes aid my progress upwards, while red circles painted on the silver fir trees make navigation easier in the dense fog. I settle into a steady rhythm, fixated on the drone of the swift-flowing stream in the valley below, the subtle decrescendo accompanying my steady gains in elevation. Voices reverberating high on the spur directly ahead snap me out of my reverie: a group of firefighters is hauling an injured hiker by stretcher, gently guiding the victim down the steep slopes in flawless unison. Such rescues are typically done by helicopter, but the poor visibility means an evacuation on foot is necessary. 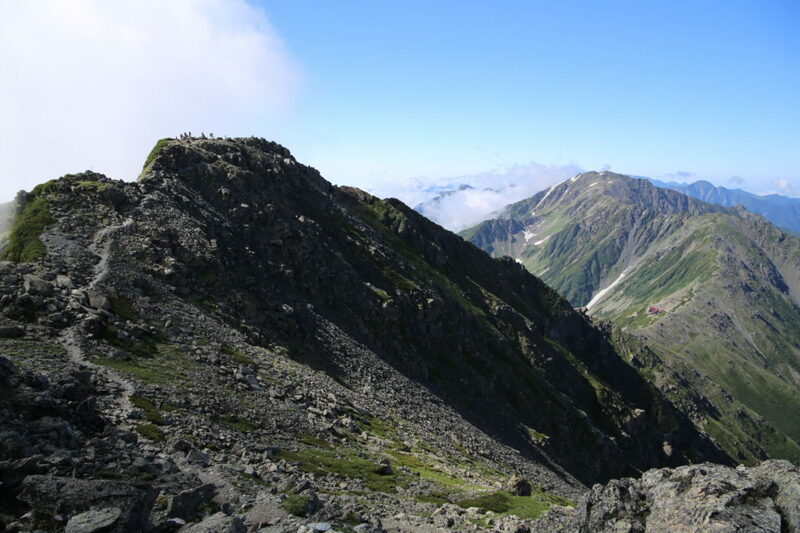 According to the Yamanashi Prefectural Police, last year there were 21 accidents in the Southern Alps, with three people confirmed dead or missing. Four-fifths of accidents involve hikers over the age of 40, with the main causes being falls or illness. 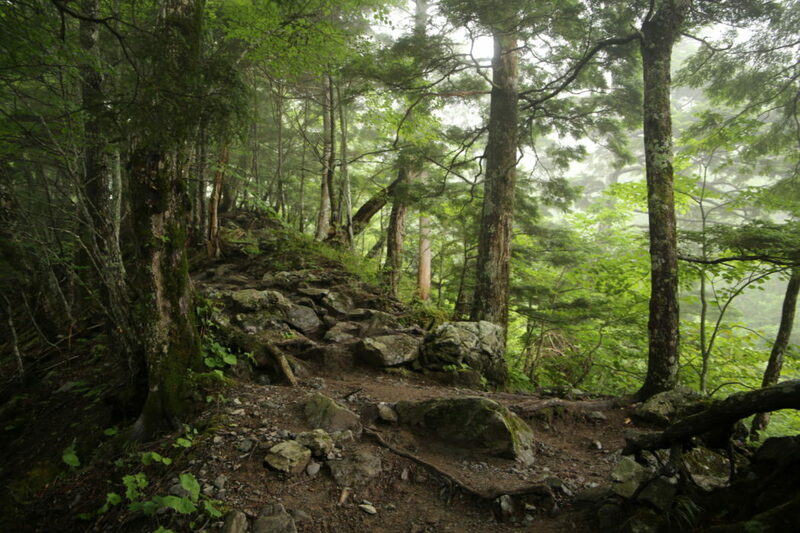 I push on, praying that I will experience neither as I continue up past the injured hiker. The path flattens out at the top of the spur and turns south towards base camp through a field of yellow summer ragworts (Ligularia dentata). I have now reached an elevation of 2200m and the air takes on a distinctly cooler tone despite the intense heat of the Kōfu plains. I arrive at the hut and head to my room. Futon bedding is stacked in two rows, with guests sleeping with their feet towards the centre of the room. Each room sleeps six, but this is doubled at weekends, with two guests assigned to one futon bed. Luckily there are only three other hikers checked in, so I grab the bed closest to the window and wait for dinner to be served. The dining room is small, so diners are grouped into separate sittings for dinner, depending on the number of guests each night. I am slotted in for the first sitting, at 4:30pm, so I gather around a shared table and start small talk with the other guests. The hut manager introduces himself and reads out the weather forecast for the following morning, along with a few tips about the trail conditions. Dinner is a standard Japanese meal of one meat or fish dish and a series of side dishes, with extra helpings of rice and miso soup on request. Not accustomed to eating dinner at tea time, I hold back on the extra helpings and politely finish everything on my plate before retreating to the common room. A group of young hikers stand by the window, observing a supply helicopter attempting to drop off provisions for the hut before retreating in defeat because of the thick cloud. 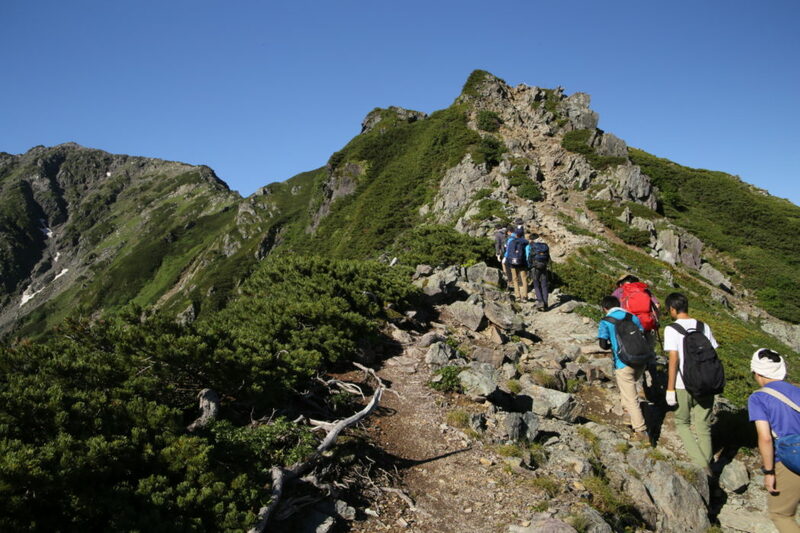 On clear weekdays, hikes in Japan’s alpine regions are often disturbed by the loud rotations of helicopter blades as the choppers make their way to re-supply the mountain huts. 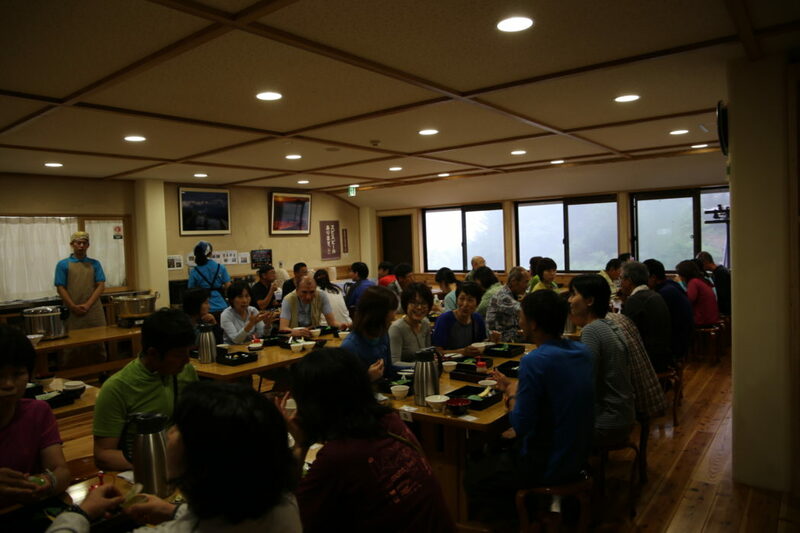 I enquire about the hikers’ destination the following morning, and instead of heading to the summit of Kita-dake, the group is bound for Kitadake Sansō hut for a week at the medical clinic. 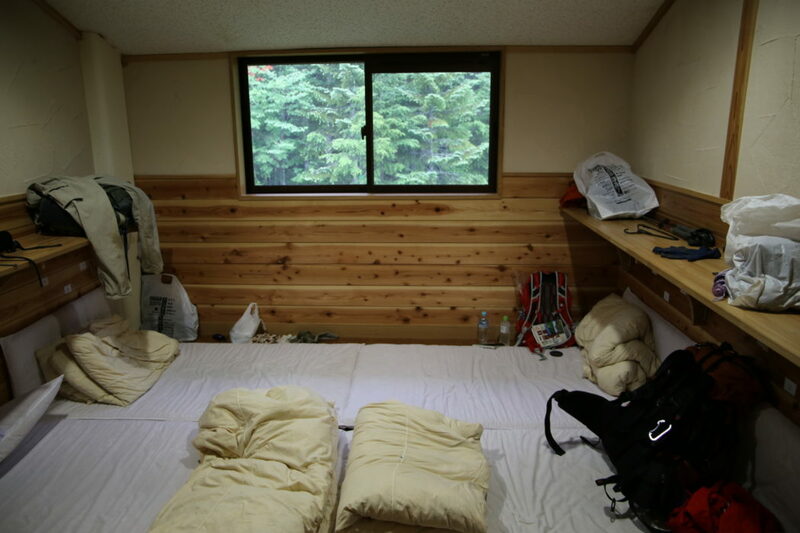 They are medical students at Nihon University, and complete part of their residency at the hut, treating hikers for hypothermia, minor abrasions, blisters and dehydration during the busy summer climbing season. Anyone can seek treatment at the medical centre, and for a small donation the eager students will provide help. The common room slowly fills with guests perusing the bookshelves and checking the news on the television in the corner. 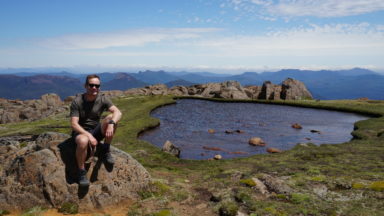 I spot a solo male hiker around my age and sit down for a chat. Mr Imamura introduces himself as a licensed mountain guide and admits that he has climbed Kita-dake more than 200 times. Most mountain guides are seasoned world travellers, and we talk in length about the Grand Tetons in northwestern Wyoming. 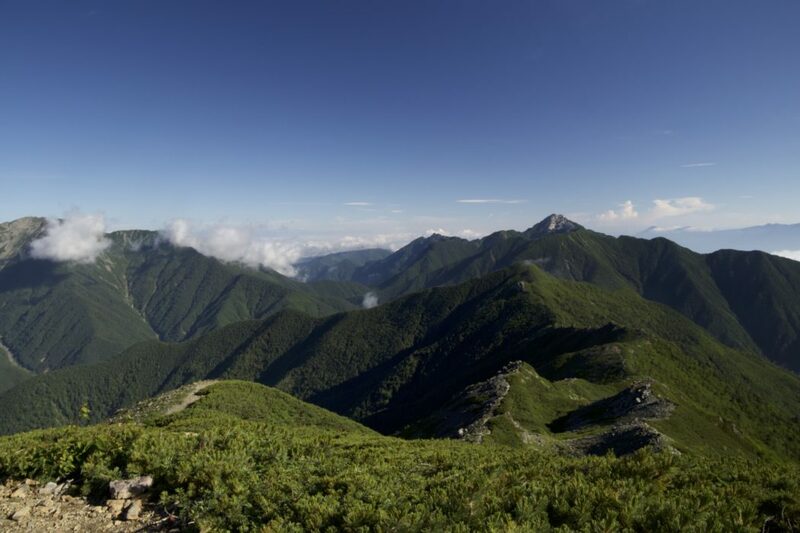 He is disappointed that I don’t have in-depth knowledge about his dream destination, so we turn our attention to the subject of Japan’s mountains. 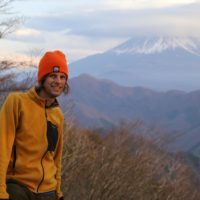 It is these times of rest between the hikes that make hiking in Japan so refreshing, and a chance to really get to know the locals in their element: sharing a love of the mountains together. An announcement over the hut audio system indicates that lights out will be at 8pm, just 10 minutes from now. Mr Imamura and I exchange business cards and retreat to our respective rooms, for an early start is in order. The lights come on at 4am, but most of the hut is already wide awake. Breakfast is served at 4:30am, so shortly before I stroll outside to check the weather and view the sunrise. 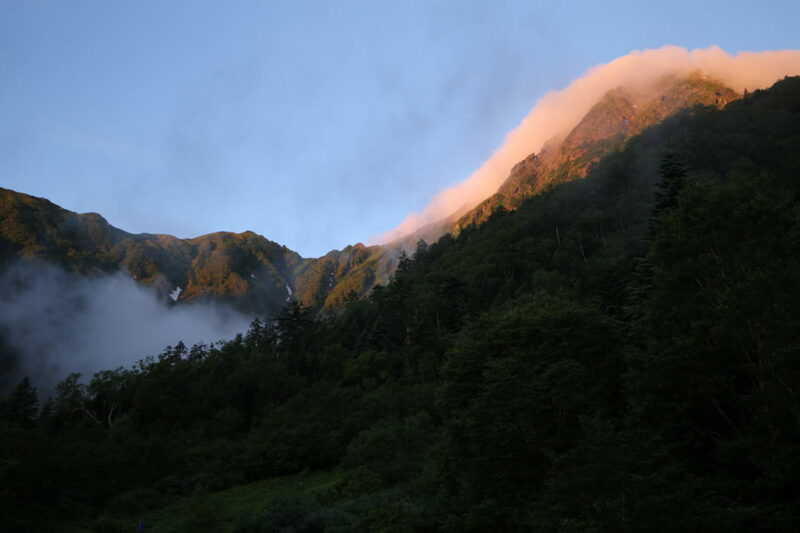 The sky is completely clear except for a thick dome of cloud covering the summit of Kita-dake. The cloud turns a deep crimson, followed by a pale pink and gold before burning off completely. The weather forecast has been spot on and my editors will surely be pleased with my timing! After breakfast I check out and start the long ascent to the alpine ridge. I am climbing straight up the western flank, the bright sun heating up my rucksack and casting long shadows on the undergrowth encroaching the narrow path. Through gaps in the foliage Kita-dake shows off her bulbous form, accented by a lingering snowfield slicing through a steep alpine meadow. 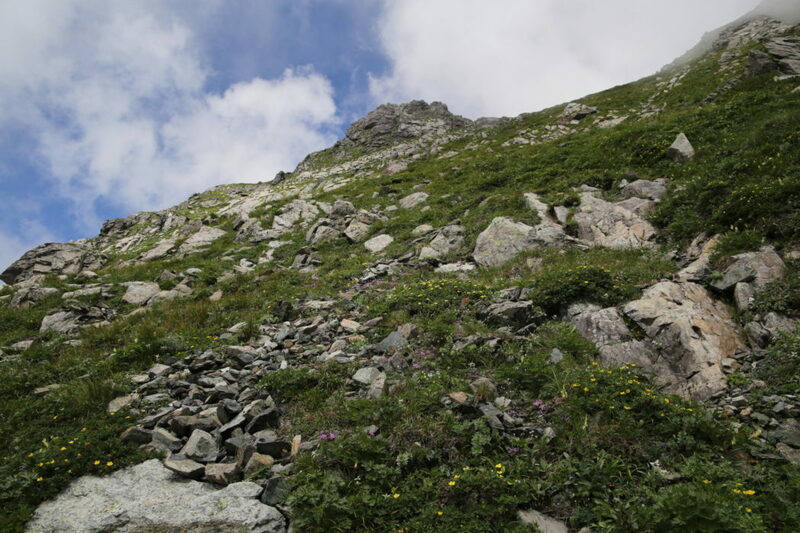 It takes nearly an hour to reach the edge of the alpine, with Erman's birch (Betula ermanii) and rowan trees fighting for space among the subalpine grasses. 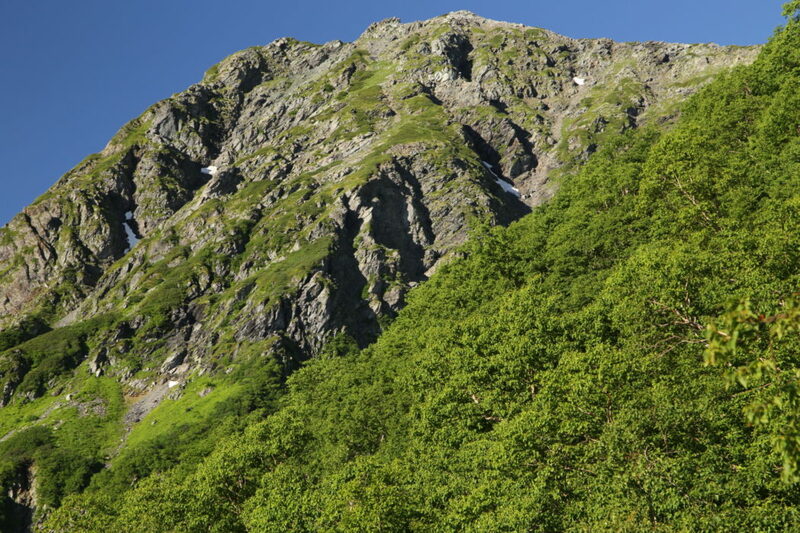 The treeline in the Southern Alps sits at 2700m, the highest tree line in Japan, which has the effect of making Kita-dake look smaller than its 3193m height. Once in the alpine the grasslands give way to large swaths of creeping pine and sedimentary rock, a reminder that this mountain range rose directly from the sea floor through tectonic plate movement over 100 million years ago. At the summit ridge the views open up in all directions, including the summit of Mt Fuji, Japan’s highest mountain and undeniable symbol. 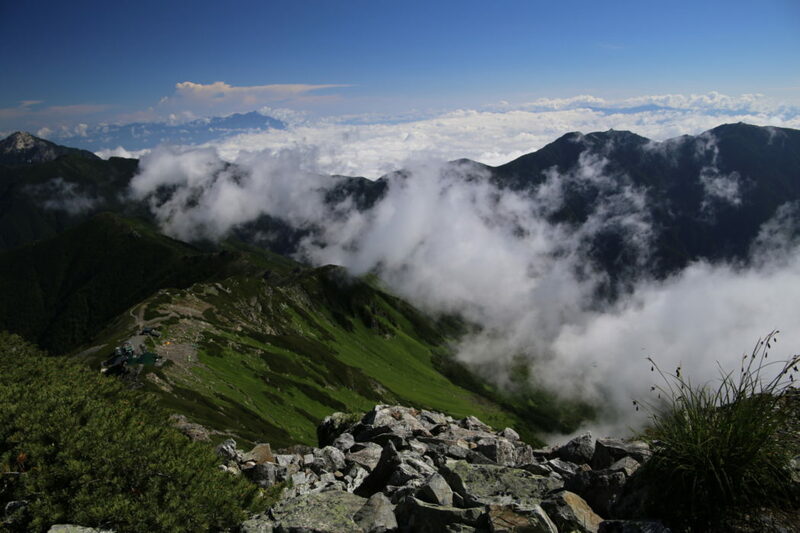 The unobstructed vistas also reveal the beginning of the daily ascension of the low-lying cloud rising up from the Kōfu plain. As the sun heats up the lower valleys, the cloud naturally rises to meet the cooler air of the mountains. 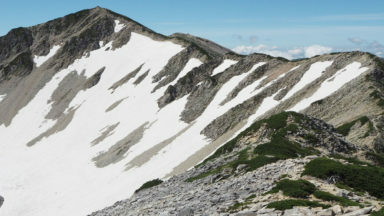 Summer temperatures regularly top 35°C in Kōfu city, while the summit of Kita-dake can dip below 15°C on summer evenings. If I don’t pick up the pace these clouds will completely envelop me and rob me of precious photo opportunities. I follow the paint marks and chain-link handrails affixed to the rocks and reach Kata-no-goya hut on the summit shoulder in just half an hour. 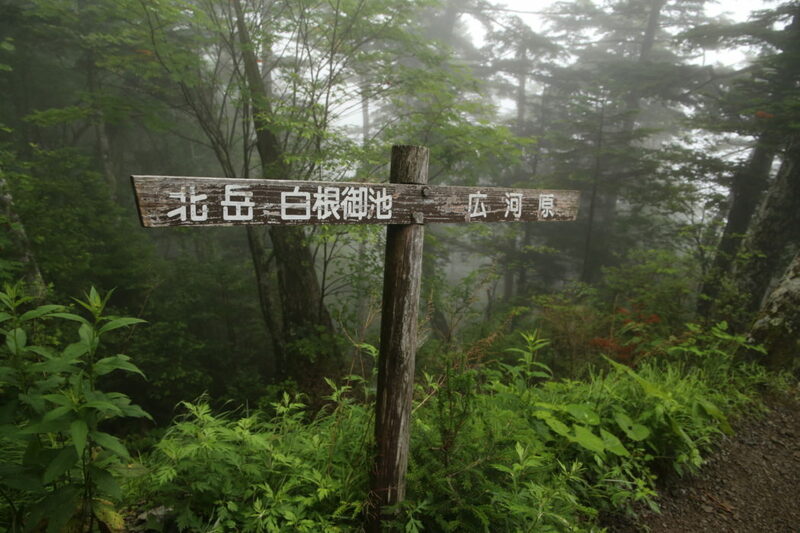 I am now at an elevation of 3000m and the clouds are just beginning to lick the northern face of Kita-dake. I push on without resting and, after passing over a false summit, I drop to a saddle and a final short climb to the summit. I raise my hands in victory, but not before raising the lens to capture what I came for: the views! There are three main huts situated on Kita-dake, two of which (Shirane-oike and Kata-no-goya) require advanced booking. Staying in huts has a number of advantages, including being able to keep warm and dry in one of Japan’s wettest alpine areas. 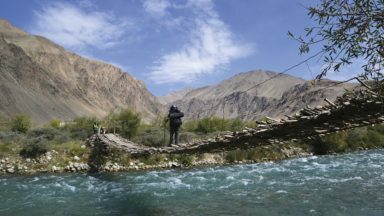 Because the huts offer accommodation with meals (£60-£65), you can travel with only the lightest of rucksacks. However, using huts requires advanced planning and means less flexibility. 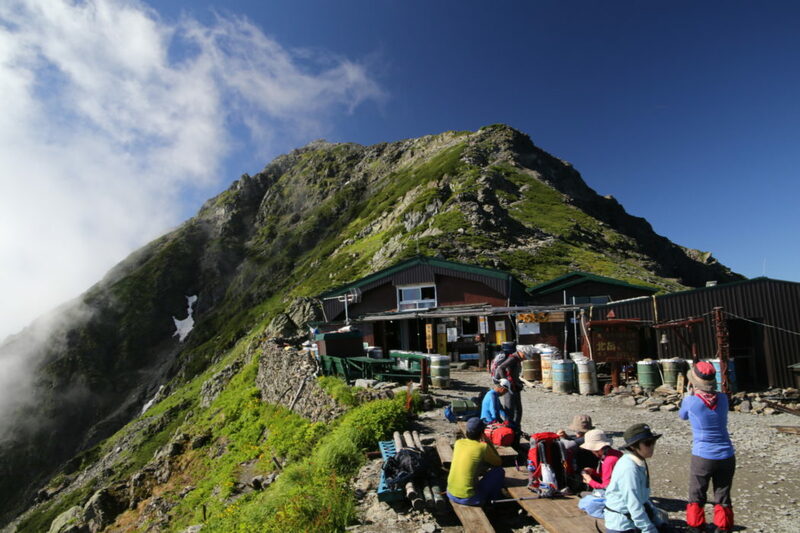 The good news is that Shirane-oike hut allows you to cancel without penalty, so fast hikers ahead of schedule can simply cancel their booking in person and continue on to Kitadake Sansō hut on the far side of the summit, where an advanced booking is not necessary. Budget-conscious hikers will want to opt for camping, as a tent pitch is just a fraction of the cost (£3-£5) and allows for much more flexibility. Pitches are located adjacent to each hut and slots are allocated on a first-come, first-served basis. The best ones are usually gone by the early afternoon and late-comers may find themselves pitching their tent on an awkward slope during the busiest season. 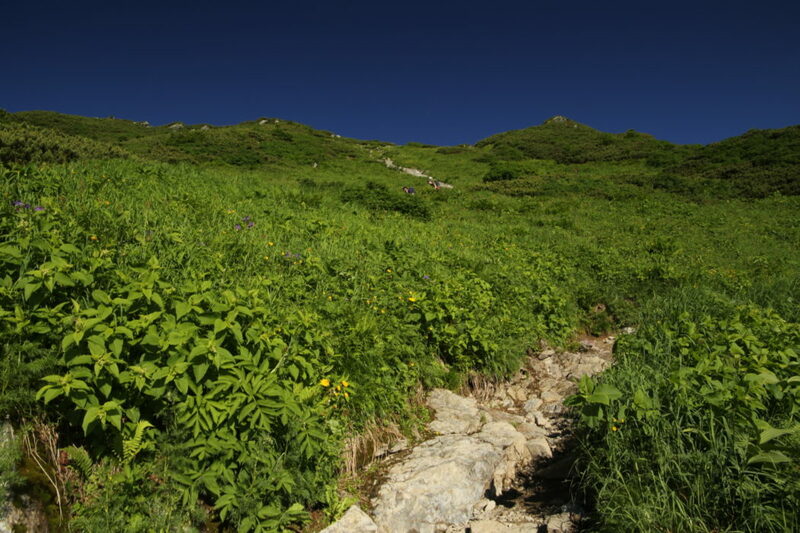 A bus service from Kōfu station to Hirogawara trailhead runs from late June to early November, with the peak season during the month of August. Japan’s rainy season lasts from roughly mid-June to mid-July, so expect days of rainy weather and lingering snowfields if going earlier in the season. 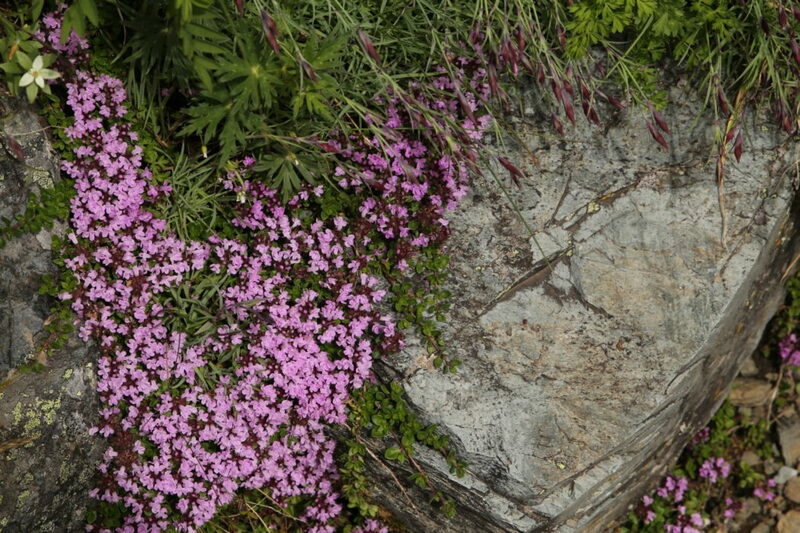 Kita-dake is well-known as an alpine flower paradise, with many endemic species not found in other parts of the world. Some of these flowers bloom during the rainy season and you’ll find seasoned flower hunters braving the elements for a glimpse of their favourite petals. 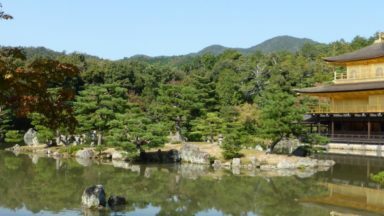 Autumn is known for pleasant weather throughout Japan, apart from the typhoons that normally peak during the month of September. 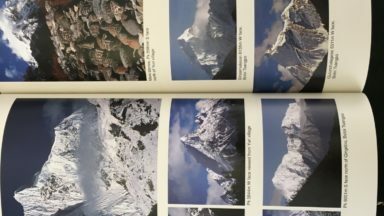 Kita-dake typically receives its first snowfall around the end of October, and those select few with winter climbing and mountaineering experience have been known to attempt a mid-winter ascent, but such attempts are best left to the experts.